IOS 8.0 or Above, Android 4.4 or Above, CE, FCC Certified. APP: Zeroner Health. 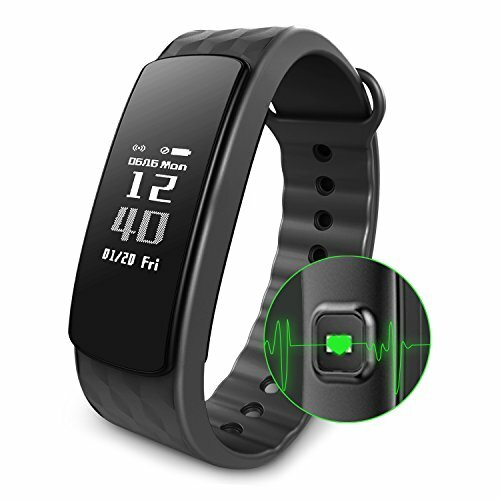 ALL DAY ACTIVITIES RECORD, HEART RATE MONITORING, SLEEP MONITORING, NOTIFICATION ALERTS, ANTI-LOST, REMOTE CAMERA CONTROL, DEVICE DATA STORAGE with EASY to USE APP, THIS IS THE RIGHT ONE TO GET. With the intelligent chip and smart "Zeroner Health" APP, this device is super easy to be connected and upgraded with the OTA technology through Zeroner Health APP. Take charge of your body today with our stylish industry-leading Smart Wristband! EASY-TO-READ 0.96'' OLED SCREEN with HIGH SENSITIVE TOUCH SENSOR KEEPS YOUR GOALS IN FOCUS with STATS, TIME, DATE and NEVER MISS CALLS OR MESSAGES THROUGH VIBRATIVE NOTIFICATIONS. Clearly and easily see your steps, heart rate, calories, distance, sleep time and sleep quality, caller ID, latest 8 pieces of messages by touching the screen. For the cost of a meal, enjoy your life when motivated. Isn't that worth it, alone? LONG BATTERY LIFE, HEALTHY LIVING, EASY TO USE BY GESTURE CONTROL. Charge the battery for about 1.5 hour from the USB connection and use the HRM for 5-7 days standby time. Gesture control for just sliding UP / DOWN / CLICK on the screen. Perfect companion will be with you everywhere you go and looks good on you no matter what you're wearing! What are you waiting for? If you have any questions about this product by Alisten, contact us by completing and submitting the form below. If you are looking for a specif part number, please include it with your message.